วันจันทร์ที่ 5 มีนาคม 2561 เวลา 14.00 – 17.00 น.
Secularism, long (and wrongly) considered a feature of modern international relations, has fallen into disuse. It has become outmoded not to take “religion” or “religious actors” into account in the formulation or implementation of international public policies, which increasingly aim at “integrating” or “involving” religious actors. In addition to conventional religious diplomacies, a growing number of initiatives aim to foster “intercivilizational dialogue” or “interfaith dialogue”. New interstate alliances based on religious criteria have emerged. And religious interpretations of human rights are legion. These evolutions, however, refer to a restrictive conception of “religion”, subject to a political filter that addresses religious categories as homogeneous, effectively representative of the adherents they claim, and necessarily distinct from the secular sphere. By selecting actors to represent much broader communities, by offering resources to religious entrepreneurs who succeed in streamlining their own agendas with the expectations of states and international organizations, or even by creating dynamics of rejection, these initiatives tend to transform the social and religious contexts in which they are deployed. It is the case in Indonesia, where one can observe the conjunction between the narratives conveyed by the main actors on the international scene, the official definition of “religion”, and initiatives implemented by co-opted religious organizations. Meanwhile, new religious movements emerge that are characterized by the assertion of their autonomy from politics and institutionalized religions. This presentation analyses the religious dimensions of contemporary world politics, to explore the ways in which official religious categories have transformed local religious representations and practices, while being transformed in return by their local appropriations. The talk is about how Malay Muslims of southern Thailand dealt with a question of subjectivity in relation to sovereignty in the wake of the recent unrest. It focuses on how they crafted their subjectivity through the sentence “เรารักนายหลวง” (Rao Rak Nay Luang, or We love Mr. King) inscribed with cooked sticky rice on a ceremonial platter they made for the participation in a state ceremony. 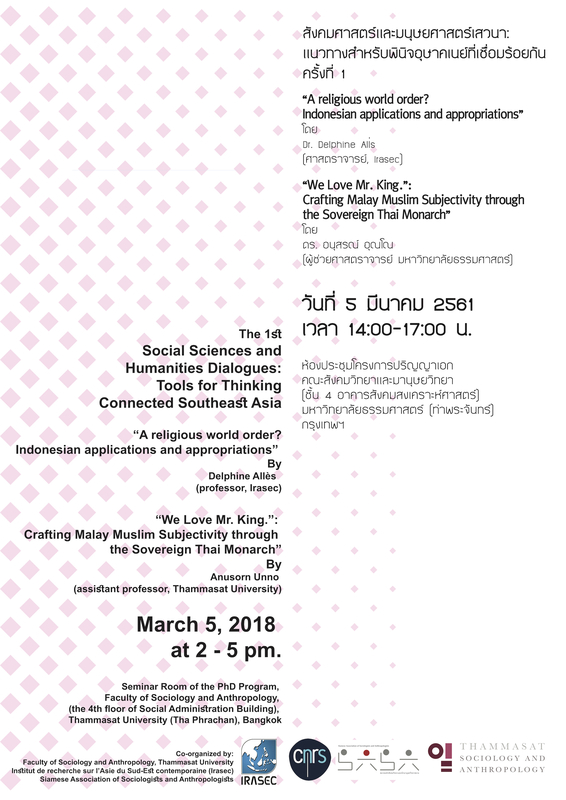 Drawing on anthropological discussion of subjectivity and agency in relation to sovereignty, it argued that, as the Thai state in a “state of exception,” the Thai monarch is a sovereign through whom Malay Muslims can craft their subjectivity and enact their agency when engaging with state authorities. It also argues that being put into an exceptional state via the title “นายหลวง” (Nay Luang or Mr. King), the king is rendered human, enabling Malay Muslims to have an intimate relationship with him without compromising their religious principles. However, while enabling Malay Muslims to engage state authorities with authority, to craft subjectivity and to enact agency through the monarch in a state of exception this way is self-contradictory, as the subjectivity was crafted by stripping the king of his god-like features, whilst agency was enacted by treating the king as sovereign. Moreover, the central feature of the king’s sovereignty, which resides in his ability to suspend the application of law, implies privilege, whereas what Malay Muslims have been demanding is equality and justice. Rather than the exceptional king in an exceptional state, it should be the Thai state with fragmented and flexible sovereignty that is a means through which Malay Muslims of Southern Thailand can realize their ethno-religious concerns and political aspirations.